Here is my "I rolled out of bed five minutes before my lecture but my bags are too big not to hide" look. If minimal effort, minimal blending and minimal make up is what you strive for on a day to day basis I may just have a solution. Over the past year or so day make up has become something I don't have the time for sadly; I'm forever looking for something that will make the time it takes to do my make up that little bit shorter. So I thought I'd share with you so far the products that have made my dreams come true where I am able to do my make-up in five minutes. 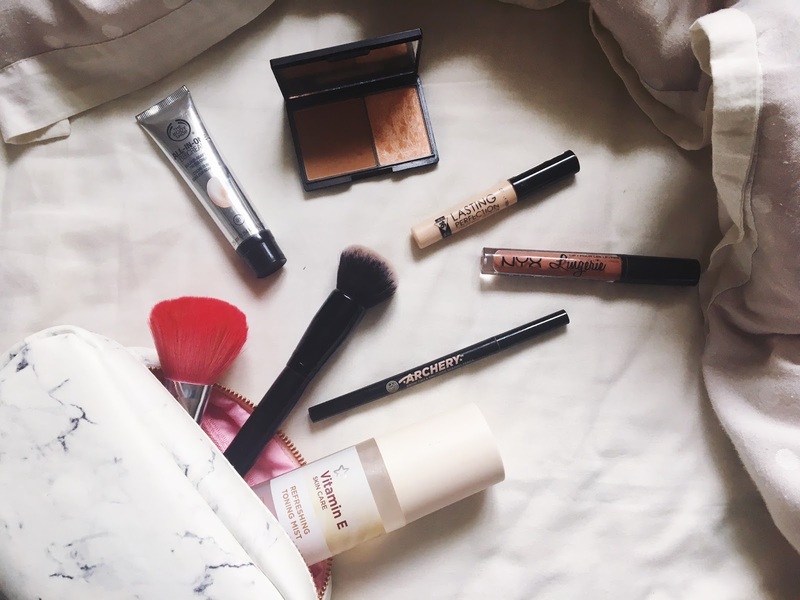 A lot of these products probably aren't new to you including my base; The Body Shop All-In-One BB Cream. Super sheer, really light weight and even offers a slight summery bronze to my milk bottle skin. Blending takes less that 20 seconds with the help of my Elf Blending Brush; perfect! While I want this too be fast, I have to make time to conceal the craters that appear on my face after a stressful week or a greasy takeout with Collection's Lasting Perfection Concealer. I apply this under my eyes and then basically over the rest of my face focusing mostly on my chin and forehead. Eye brows are the most time consuming but The Soap & Glory Brow Archery isn't a bad shout- it shaves seconds off by not having to root around for my eyebrow brush and an eyeshadow of the right colour. Contour and highlight is the same as always with the Sleek Contour Palette. These days, I tend to forget about powder but if I do Soap & Glory's One Heck Of A Blot is what I grab for. An extra step but, if I'm feeling cocky about having enough time, I'll add is a recent favourite; Superdrug's Vitamin E Refreshing Toning Mist. It's so nice in this humid whether and gives a little bit of a dewey look to the skin. I also feels it's stop me fearing scratching my face in worry my make up will slide off with it as it helps set it in place as well. Mascara is a no go with me. I'll end up sneezing before it's set and adding an extra two minutes to my time as I try to find a cotton bud and attempting to remove the black bags that have now formed under my eyes without making it any worse. And, if I have even more time to spare, I'll choose a lipstick; another current favourite is the NYX Lip Lingerie which is easy to apply and last a decent amount of time. And then I'm done and heading out the house with time to grab a slice of toast on the way. Any tips to make my morning make up even faster?